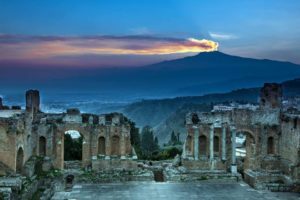 The most important, oldest and bigest monument of Taormina is certainly the Greek Theatre.Was built in a wonderful panoramic point, from where you can admire the size of Mt.Etna and the Ionian Sea. On a few steps is written the name of Filistide, the wife of Hieron II, the tyrant of Syracuse that probably in the 3rd century a.C. built the theatre. The building was rebuild in roman age, precisely in the second century b.C. The cavea,that is the space for the steps, has a diameter of almost 109 m and is devided in 9 sectors. 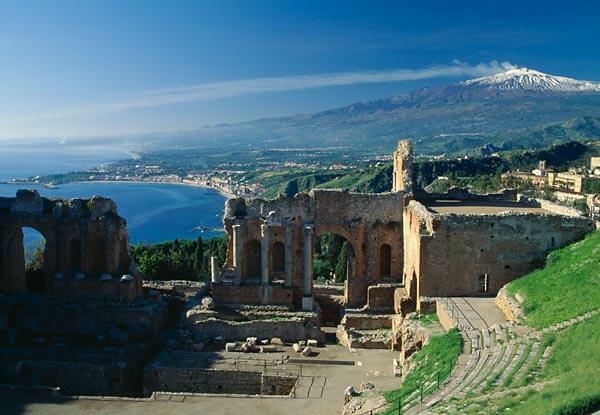 The theatre of Taormina, for dimension, is the second largest of Sicily after the one of Syracuse. At the top of the stairs you can fin a double door, covered by a vault. Thirty six small niches open on the wall of the door and maybe were used to sustain some statues. In roman age,the orchestra of the theatre was trasformed in arena for the games of the gladiators. The scene presents three big openings,lined by niches and columns relocated here in the 19th century. 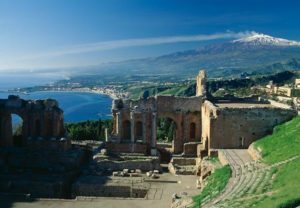 By years, the theatre of Taormina is the wonderful frame of cultural events and awards of international level. Do you want to know THE GREEK THEATRE?